The state of West Virginia has major higher education aspirations for its residents over the next decade; the goal of the new West Virginia Climb initiative's is to help 60 percent of the workforce hold a college certificate or degree by the year 2030. In order to do so, the state’s colleges and universities have committed to offering greater access to educational opportunities. One way to facilitate this is through online education. West Virginia students have 45 degree-granting institutions in the state to choose from, several of which offer online learning options. 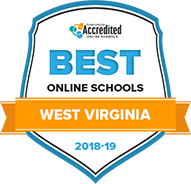 Read on for more information on how online college works, find answers on common online tuition and transfer credit questions and learn what makes the best online colleges in West Virginia stand out from the pack. When deciding which online school in West Virginia to attend, students should think about cost, location, amenities, resources, career assistance and available majors. But most importantly, the best choice for one person may not be the same for someone else; learners with a first responder or military background may take advantage of tuition discounts at schools such as the University of Charleston, while single moms might look for programs that provide drop-in childcare like the University of West Virginia Parkersburg. The list below ranks some of the best online schools around the state based on their ability to provide a high-quality education and well-rounded student support services. At West Virginia University, students have to the choice to enroll in over 30 different certificates, undergraduate, and graduate online programs. Options include bachelor's degrees in child development, business, nursing, and multidisciplinary studies, as well as master's degrees in music industry, safety management, and more. Nontraditional learners can earn a Regent Bachelor of Arts, which grants credit for work and military experience. While certain programs require residency, others are offered in a fully online format, and often include live lectures via eCampus. Required credit hours and length of time for completion vary by degree type. Graduates of WVU Online, which is accredited by the Higher Learning Commission, have entered the workforce as special education teachers, accountants, fraud examiners, and music producers. Students enrolled in distance learning at Marshall University reap the benefit of paying tuition comparable to the school's in-state rates. Accredited by the Higher Learning Commission, fully online programs are available to complete a number of certificates, undergraduate, and graduate degrees in disciplines ranging from geography to nursing. Students can also participate in hybrid courses, which incorporate both online and on campus work. Due to the flexible nature of online coursework, graduation requirements and program duration vary. As an online student, you will have access to a number of resources, including advising, career assistance, the writing center, the library, and financial aid opportunities. There is also 24/7 technical support to assist students in navigating Blackboard Learn, the platform used for online courses. Wheeling Jesuit University provides an education rooted in faith and service to others. Although most academic programs are held on campus, students already possessing a bachelor's degree have the option to complete an Accelerated Certification for Teaching (ACT), or a Master of Science in Nursing (MSN) in a fully online format. The 18-month ACT program, which is accredited by the Teacher Education Accreditation Council, builds a customized Academic Action Plan for each student. The MSN program is accredited by the Commission on Collegiate Nursing Education and makes use of a cohort model to prepare students for careers as nursing administrators, family nurse practitioners, and nursing education specialists. Accredited by the Higher Learning Commission, the University of Charleston is a nonprofit academic institution offering 10 online bachelor's, master's, and doctoral degree programs in disciplines such as business administration, nursing, and leadership. Students can speak to an academic advisor regarding their degree of interest, as programs vary in duration, workload, and prior credit requirements. Financial aid and military discounts are available to assist in paying for courses, which are semi-structured and administered through the platform eLearn. Graduates of UCWV online programs find employment as business managers, network administrators, and case managers. Founded in 1890 and continuing its tradition as an HBCU, West Virginia State University offers undergraduate students a choice of 6 fully online degree programs, while graduate students can pursue an online master of education degree. The school's library comports with ACRL online learning standards and offers distance learners the same full menu of services as on-campus students. Transfer students must have achieved a GPA of at least 2.0 and earned at least 30 credits. Those with fewer than 30 credits must submit high school transcripts. Distance education at Bluefield State College is delivered not only online, but also through DVDs, CDs and television, although Moodle is the central learning management system. Bluefield's online classes are kept to a small 11:1 student-to-teacher ratio, and with the appropriate course selection and having prior credits to apply to their degree, students can earn online bachelor's degrees in as little as 13 months. There are also 4 graduate programs for students pursuing master's degrees or a teacher's certificate. How Can I Find Which Online Colleges Offer the Degree I’m Looking for in West Virginia? Online colleges in West Virginia make it easy for students to find programs by listing all available majors on their website, and detailing whether the program is fully online partially online or on-campus only. For example, the University of Charleston and Marshall University both host pages dedicated to their online programs. Fairmont State University also allows students to search for online courses. Check the website of the college that interests you, and if you don’t find what you are looking for contact the school’s admissions office for more help. Which Online Schools in West Virginia Will Accept My Transfer Credits or Work/Life Experience? Most schools in West Virginia accept transfer credits from other accredited colleges, but each school has unique policies, rules and regulations. Some accept a high number of credits, while others only accept a limited number. Students should contact an admissions adviser to learn more about specific policies. Non-traditional students can also earn credits for life and work experience. For example, students with a military background can receive credits from the University of Charleston. Similarly, West Virginia University and Fairmont State University allow students to complete a prior learning assessment in order to earn credit for relevant life and work experience. How Much More Do College Grads in West Virginia Make? Completing a program in West Virginia helps train people for new job opportunities; the experience also helps individuals make more money each year. In fact, the higher the degree, the higher the average annual salary. The following chart illustrates how much careers with each of the minimum degree requirements pay, on average, in West Virginia. West Virginians boasts several key industries that require college degrees, including energy, information technology, and aerospace. Employers in these fields look for candidates with highly specialized training. In fact, Georgetown University reports that 55 percent of jobs in West Virginia will require at least an associate degree by 2020. Although 30 percent of workers in the state have some higher education, this number will have to increase significantly in order to meet industry demands. In order to adequately gain skills and prepare for the workforce, students must receive a quality education. Prospective students in West Virginia should look for colleges that have been accredited by the Higher Learning Commission. Accredited schools go through a rigorous screening process and receive several reviews. Accreditation certifies that these schools’ programs, policies and procedures meet the highest educational standards. Schools can also apply for accreditation by subject or specialization. At Marshall University, for example, the journalism and mass communication program holds accreditation from the Association for Education in Journalism and Mass Communication, in addition to their standard, regional accreditation. According to the National Center for Education Statistics, during the 2015-2016 school year, state residents who attended public colleges paid $6,900 for tuition and fees. Their counterparts at private schools paid $11,721. However, these rates still fall far below the national average. In order to encourage students to come to West Virginia to attend college, some schools participate in the Southern Regional Education Board’s Academic Common Market. This option allows out-of-state students to pay in-state tuition rates. Students from Virginia, Arkansas, South Carolina, Tennessee, Mississippi, Louisiana, Alabama, Delaware, Oklahoma, Maryland, Georgia and Kentucky can take advantage of these reduced rates at participating schools around the state. What are West Virginia’s requirements to qualify for in-state tuition? Out-of-state students who want to attend college in West Virginia may consider becoming a resident in order to qualify for in-state rates. But double-check with your school first—some online colleges already charge distance learners the same rate as their in-state students. For those looking into changing residency, the process requires candidates to reside in the state for twelve continuous months before school begins. Applicants can prove residency by providing a valid state driver’s license or copies of state tax returns. Additionally, members of the military currently serving in West Virginia qualify as residents for tuition purposes. Are Online Credits More Affordable in West Virginia Than Other Places? How Can I Get Help Paying for Online College in West Virginia? Public and private online colleges in West Virginia offer a number of scholarships to state residents. Students can also apply for scholarships through businesses, foundations, non-profit organizations, professional associations, and other sources. West Virginia Higher Education Grant: West Virginians enrolled in an in-state college can qualify for this grant. Applicants must demonstrate financial need. West Virginia PROMISE Scholarship: This scholarship is awarded to high school graduates with a minimum 3.0 GPA and an SAT score of at least 1100. West Virginia Nursing Scholarship Program: This award benefits students who enroll in an accredited nursing program at least half time. Recipients may study to become a registered nurse, nurse educator, or licensed practical nurse. Underwood-Smith Teacher Scholarship: Students who plan to earn an education degree in order to teach elementary, middle, or high school in West Virginia can receive this scholarship. West Virginia Engineering, Science and Technology Scholarship: Students attending a STEM-related program may receive this scholarship. Applicants must agree to work in a STEM job in West Virginia after graduation. Candidates should have at least a 3.0 GPA. In order to be considered for state and federal financial aid, as well as scholarships from individual schools, students must first fill out a FAFSA, or Free Application for Federal Student Aid. By submitting this application, schools can determine students’ eligibility for loans, scholarships and grants. Adult education programs teach students valuable skills that can help bridge educational gaps between high school and earning a college degree. According to the U.S. Department of Education, over 4,100 West Virginians took advantage of these programs from 2016 to 2017. These adult education programs are especially pivotal for individuals facing challenges with long-term unemployment, homelessness, disabilities or criminal records. College and career exploration services – For aspiring college students that aren’t sure about their career and degree options, the guidance provided by these programs aim to help prepare West Virginia students up for success. High school equivalency testing – Those who want to earn their high school diploma as a first step to going back to college can do so through these West Virginia adult education programs. Pre-College Basic Education courses – Developmental courses in basic math, reading and writing can help prepare those who have been out of the classroom for some time reacclimate and prepare for college-level learning. Transferring to college – West Virginia students wishing to enroll in college after completing transitional learning (basic math, reading and writing) classes can take advantage of these adult education programs. To find an adult education location near you, visit this directory by the West Virginia Department of Education.